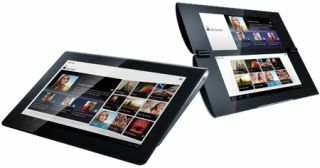 Sony Tablet to launch this Autumn running Android 3.0 | What Hi-Fi? Sony has confirmed it will launch two Sony Tablet portable devices later this year. They will run the latest Android 3.0 software, designed especially for tablets. There will be two devices, both scheduled for release this Autumn: a 9.4in device, codenamed S1, and a dual-screen device with two 5.5in screens, the S2. Both tablets will be "wi-fi and 3G/4G" compatible and will come bundled with access to Sony's Qriocity music and video store and Sony's Reader Store for eBooks. PlayStation Suite will also give users access to first-gen PlayStation games on their Tablet. The tablets will also double as remote controls for your various home cinema devices using DLNA functionality.